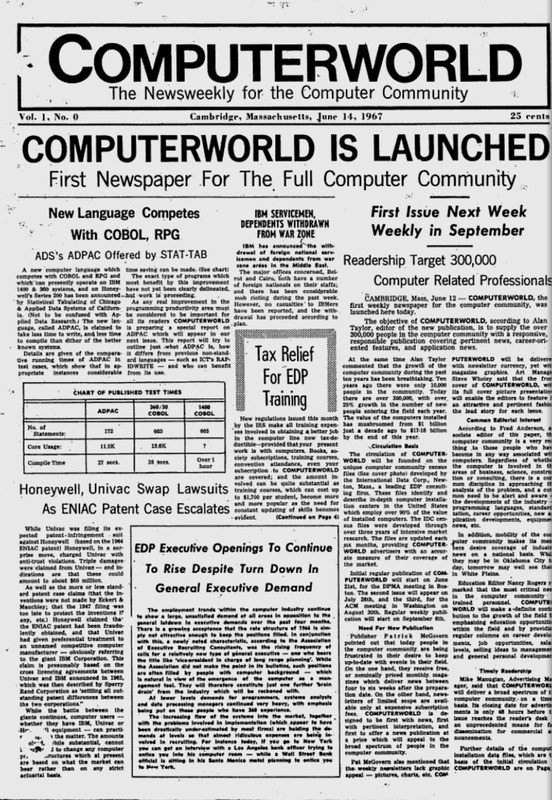 When IDG’s Computerworld launched, with an issue cover-dated June 14, 1967, it declared itself to be the “first newspaper for the full computer community.” I have no reason to believe that was an inaccurate claim. And if there’s an older publication devoted to computing which still exists in print form, I don’t know about it. But Computerworld‘s long, long run in dead-tree form is ending. As editor-in-chief Scot Finnie writes, it will publish its last print edition next week, almost exactly 47 years after the first one appeared. The brand will live on as a website, of course, and as a monthly digital magazine. The news comes three months after the passing of Pat McGovern, who started IDG in 1964 as a research firm and put out Computerworld with a tiny staff in its earliest days. It’s sad to think of IDG losing its founder and flagship print publication so close together, but in a way, it’s also fitting. Any explanation of why this venerable publication is killing print in 2014 is pretty much superfluous–in fact, it’s a miracle that it made it this far, and I wasn’t positive that it hadn’t already happened until I heard this news. For years, a weekly newspaper–which is what Computerworld was for most of its existence–was an ideal way to stay on top of tech news, and a business proposition with plenty of potential. It’s been years since either of those statements was true. Computerworld had a relatively low profile, almost by definition: It was aimed at IT decision makers in big companies, not PC users or gadget nerds, and rarely showed up on newsstands or anywhere else where someone who wasn’t part of its target audience might stumble across it. But it was a pioneering and influential publication–and the first newspaper or magazine published by IDG, which went on to produce hundreds of them around the world, including dozens of editions of Computerworld. I was never a reader of Computerworld‘s print incarnation except in my professional role as a technology journalist and IDG employee; I didn’t fit the profile of the reader it served. (I have spent plenty of time at its website, which has long catered to a broader audience.) But in one way or another, it’s been part of my life for decades, dating back at least to my high-school days, when an extremely short-lived Computerworld TV show did a segment on my school’s computer lab. At IDG, where I started in 1991, Computerworld mattered in a way that other publications never could–even if they were better-known brands or contributed more to the bottom line. It was the rock on which the IDG publishing empire was built, and symbiotic with Pat in a way that something like PC World wasn’t. When IDG decided to launch an Antarctic website so it could proudly claim to serve readers on every continent–and yes, Pat traveled to the South Pole as part of the launch–there was no question which IDG brand the site would carry. Those of us who managed the PC World business regarded Computerworld as if it were an overachieving older brother, with a combination of awe, respect, and competitiveness, and–at least occasionally–a smidge of jealousy. I imagine that will continue to be true even in the digital era. So with Computerworld leaving print behind, what’s the oldest remaining computer publication which is still available as ink on paper? Internationally, I’m not sure; it might even be an edition of Computerworld. In the U.S., I can’t think of anything which has been around longer than IDG’s Macworld, which turned thirty in January. But I may be forgetting something. If you know of any publications which were founded in 1983 or before, and still live on in print form, please lemme know. APC (Australian Personal Computer) has been running since 1980 (as a monthly) and continues to this day. Communications of the ACM started in 1957. Founded June 7, 1982, Computer Reseller News or CRN Magazine is still very much a print magazine. It’s located just about a across the street from Computerworld’s offices. Wonder how long the 100+ overseas editions of Computerworld continue in print? I used to compete against Computerworld Hong Kong, a small but perhaps liveliest regional edition under former editor Don Tennant. And I later wrote for the US edition of Computerworld. MIT Technology Review was founded in 1899. No way, really, geezus, wonder if there’s some EU publications that predate that.